There are two options to get to the city centre if arriving at Seville Airport, either by airport bus or taxi - see below for details. We can also provide a door-to-door transfer service. The red city buses run by Tussam are the main form of public transport in Seville, but there are few routes within the historic centre itself, so the best options for exploring the city are either walking or taking a taxi. 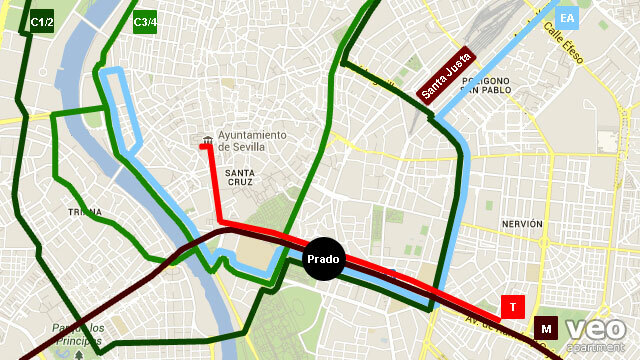 The main hub for the different modes of transport is the Prado de San Sebastián, which is marked as a black dot in the diagram above. As well as the metro and tram, there are stops for many of the city buses, including the Airport Bus. For trips out of town there is the Prado de San Sebastián bus station. For apartment guests staying within the historic centre, the CIRCULAR bus lines C3 and C4 are probably the most useful ones. They run along the ring road which circles the historic centre of the city, following the line of the old city walls. The C3 runs clockwise, and the C4 counterclockwise, so you only have to look for one of the many stops on either side of the street. The C1/C2 buses also follow a circular route but go further out, passing Santa Justa train station, and on the other side of the river, Isla de la Cartuja and the Triana neighbourhood. The cost of a single bus trip is €1.40 which is paid directly to the driver. You can also buy the 10-ticket pass ("bonobus") which costs €1.50 for the plastic card plus €7 for 10 trips. These can be topped up 10 trips at a time at a Tobacconist shop ("Estanco") and most news-stands. The airport bus service EA (Especial Aeropuerto) connects the airport to the city centre. It partially circles, but does not go into, the historic centre. The final stop is at Plaza de Armas. From there you can take a C3/C4, or a taxi, if required. The price is €4, one way. The airport bus timetable, together with those for all the city buses, can be found on the Tussam website. There is currently one line in the metro underground system linking one or two outlying towns and the city suburbs. There are only two stops by the historic centre - the Prado de San Sebastián and Puerta de Jerez. The metro probably won't be of much use for a trip to the city unless visiting Pablo de Olavide University, the second public University of Seville, and the end of the line to the South-East. There is only one short line, T1, which links San Bernardo via the Prado de San Sebastián to Plaza Nueva in the city centre. It connects with the C3/4 bus and the airport bus at the Prado and the train station at San Bernardo. Because it's a flat rate the meter will be switched off, and there is often no price indication inside the cab, so unscrupulous drivers will charge anything from €30 to €60 on arrival. Therefore, we strongly recommend that you confirm the price BEFORE getting into the taxi. Inside the city centre, the meter must always be in use, and fewer cases of fraud have been reported to us. A dishonest driver may take a longer route but, at least, the amount asked for will be according to the meter. Seville map Geography and neighbourhoods. El Centro neighbourhood The heart of Seville. El Arenal neighbourhood Tradition and vibrancy. Santa Cruz neighbourhood Old Jewish quarter. Macarena neighbourhood Character and authenticity. San Vicente neighbourhood Churches and convents. Triana neighbourhood Flamenco, ceramics and pottery. Royal Alcázar Palace Mudéjar palace and gardens. Cathedral of Seville The largest gothic church in the world. Monuments Guide to explore Seville's monuments. Event calendar Semana Santa, Feria de Abril, etc. Seville in 48 hours Getting the best out of a two-night stay in Seville. Spanish language schools Spanish schools in Seville. Museums Guide to enjoy the museums in Seville. Guided tours Walking, bike and tapas tours. Maria Luisa park Seville's famous park, moments away from the historic centre. Tapas Eating out where local residents go. Markets Food & Street markets in Seville. Flamenco Tablaos & Flamenco schools. Pirate boat cruise Theme boat tour on the Guadalquivir. Seville for Kids Fun and family attractions.